In glorious Crims-o-rama! These strips write themselves. Hey, just what is inside that ol' potbelly stove anyway? by L.S.Erhardt on 4/26/2012 @ 2:33am The stove is filed with IFO-380, obviously. by Mark Monlux on 4/26/2012 @ 6:59am Ack! by NineInchNachos on 4/26/2012 @ 8:22am he's not supposed to loaf in one spot for too long. by InvaderPet on 4/26/2012 @ 8:52am Birdkiller! That's the REAL reason behind the bird attack in "The Birds"! Stove kills birds.... stove was created by man. by NineInchNachos on 4/26/2012 @ 8:57am hmm according to the potbelly stove chilton shop manual the emissions are mostly harmless steam and hickory flavor... the mass die off is probably just an unrelated coincidence! by CaptainBritton on 4/26/2012 @ 8:58am Poot! by troysworktable on 4/26/2012 @ 9:39am I really like the split panels of 1/5, 2/6, 3/7, 4/8. Progress! 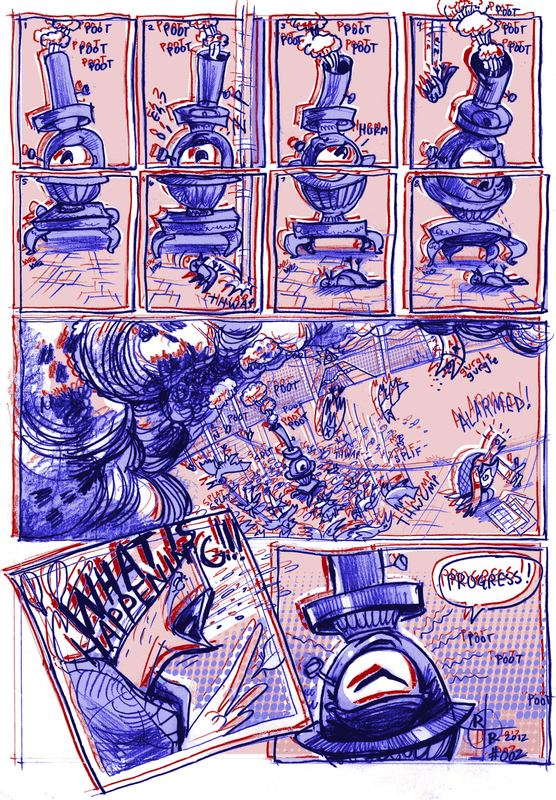 by Joel 413 on 4/26/2012 @ 10:40am Now do this same comic again in blue-o-vision and add in a 2-4px shift. Overlay and 3-D! by CaptainBritton on 4/26/2012 @ 11:08am Yeah! What Joel said! by Joel 413 on 4/26/2012 @ 11:20am The smoke billows out of teh screen, the birds falling in mid-air. Herbie jumping out screaming "What's Happening!!!" The Poot's at different depths... this would totally be an awesome #D page. by L.S.Erhardt on 4/26/2012 @ 5:15pm DONE. I don't have 3D glasses. Can someone tell me if it turned out OK? by CaptainBritton on 4/26/2012 @ 5:52pm Not bad! I only have a cheezy-kids pair, I'm sure with a better pair It would look even better. You can read it really easily. by debivans on 4/26/2012 @ 7:06pm The "WHAT IS HAPPENING!!!" Turtle panel is so older sister Poltergeist. by L.S.Erhardt on 4/26/2012 @ 9:20pm @Fredo: click on it. by CaptainBritton on 5/5/2012 @ 5:24pm And now time for some Stove fan art!!! by NineInchNachos on 5/5/2012 @ 8:19pm fan-tastic fanta-graphical !